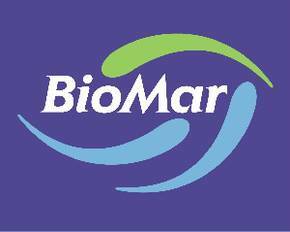 BioMar Group is developing, manufacturing and marketing fish feed with a global market share between 12 and 20% within the segments of salmon, coho, trout, sea bass and black sea bream. The company has factories in 6 countries and an annual capacity of 505 000 tonnes. The sale and distribution of BioMar cover all of Europe, Chile and other selected markets of Asia. The company employed around 500 people and had an annual turnover of 2.676 millions DKK in 2002. BioMar Group is owned by Treka. BioMar R&D Group includes 16 scientists (7 in Norway, 2 in Scotland, 5 in Denmark, 2 in Chile). The R&D Group has access to pilot facilities for production of experimental feed at BioMar’s Technology centre in Brande (DK), and freshwater tank facilities at Hirtshals (DK) and for seawater at Doenna (N). BioMar R&D has close co-operation with its manufacturing and marketing units, and has for several years co-operated with fish farmers and national and international research institutes. Internal and external personnel have driven the development of the commercial feed through product oriented R&D work with expertise within fish physiology and nutrition. Ellinor Helland (Project 5.1 BIOQUAL).